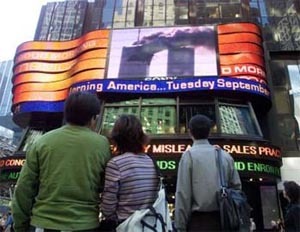 A "small plane" is reported to have just crashed into the North Tower of the World Trade Center [AFPS, 10/23/01]. The news media kick into action: cameras are set up, helicopters and light aircraft take off for a better view. President Bush later that day claims to have seen the first plane slam into the WTC live on TV [CNN, 12/4/01] but, in reality, not having the power of prescience, the news media were not exactly ready and waiting for the first plane. The first plane, though, was a ploy. In a carefully orchestrated strategy, it was merely used as bait, drawing our attention to was about to occur, and so guaranteeing a full-blown Hollywoodesque drama with all the ratings and world-wide video sales. Welcome to the 21st Century. On cue, a few minutes later, the second plane, a United Airlines, Boeing 767-200, comes into view, flying low and heading for the Twin Towers. What was that? What happened? Where was our mighty Air Force? All valid and essential questions, which the 9/11 Commission, eventually headed by Thomas H. Kean, the former Republican governor of New Jersey, was asked to look into. New York, with its rich ethnic and social diversity, is a city which everyone in today's global village easily identifies with. We've all been there, if only on film or TV. We all admire its message of a new life free from oppression and class warfare. 1. Who overrode Flight 175's onboard computers? Modern planes are complicated creatures that incorporate a whole slew of sophisticated technology. First among them, flight computers that instantly override any accidental brusque manoeuvres; you don't want your business-class customers slopping their Dom Perignon over their immaculate suits, just because the pilot sneezes at the wrong moment. 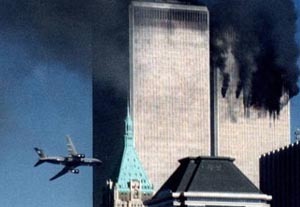 The banking manoeuvre we see here, just as flight 175 is about to slam into the South Tower, would have been overridden by the onboard flight computer. So somebody must have previously overridden the flight computers themselves. Now, you don't override the onboard computers by physically switching them off or cutting a wire, as you'd lose control of the hydraulics and plummet like a stone. Hey, this is no lawnmower you're flying. You have to reload the software, which according to Boeing's own documentation takes a good 90 mins. just for the Integrated Display Units alone. 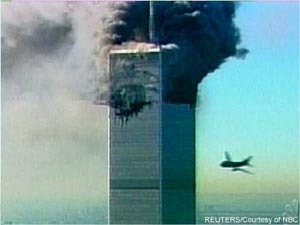 United Airlines Flight 175 took off from Boston at 8:14 a.m. to hit the South Tower at 9:03 a.m., meaning that the software for flying the plane at close to Mach speed would have had to have been installed before take off! Come on, no self respecting muslim fundamentalist goes to heaven without his trusty Koran clasped to the breast! That's as ridiculous as saying that you've just found Mohammad Atta's pristine passport sitting atop one million tons of smouldering rubble! 2. "Ceci n'est pas une pipe"
Pardon my French, but this is not a Boeing 767-200. This is the long-fuselage version of the 767. The 767-200 is a short, stubby-nose plane. I didn't waste my early teenage years sniffing modelling glue and assembling 1/72nd-scale Spitfires for nothing, you know. More on that later, here. 3. What the Fr**ce is that on the underbelly? Eduardo Martín de Pozuelo and Xavier Mas de Xaxàs, two journalists at the La Vanguardia newspaper in Barcelona, Spain, did a nice breakdown of the digitised images here. Of course, they work for a newspaper with a 100-year-old reputation to protect.